It may not actually hover, but hoverboards have proven to be quite a popular gadget in the past year. Popular not just with kids and teens, even adults are finding themselves enjoying the very futuristic feel of them. A hoverboard may not look like what people remember from the movie Back to the Future, but it is actually worth investing in. 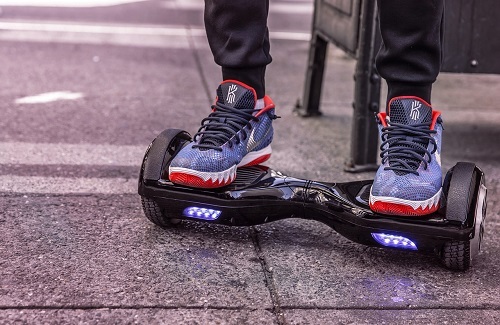 Due to the rise in popularity, many types of hoverboards have been produced. They can range from cheap to pricey depending on the features and battery life. There are many factors to consider when buying the best hoverboard in 2017. Consumers may consider ease of use and safety as some of the most important qualifications in deciding on a purchase. If you are thinking of buying this popular gadget soon, consider the following hoverboards that can be considered some of the best on the market today. This model offers two different speed modes and is noted as one that would work well for beginners as well as more experienced riders. Some of the features include a fireproof exterior casing, sensor pedals, and a decent battery life. However, one of this model’s downside is that it takes three hours to fully charge, which may not sound appealing for some who do not like to wait. With two electric motors, this model is the king of speed. It can carry up to 220 pounds and is constructed from high quality materials. It also has Bluetooth capability and other features such as an anti-theft alarm and customizable lights. If you’re the type that loves listening to music while going for a ride, then this board is perfect for you. Made of materials that are considered to be of the highest quality, this hoverboard model actually has a Bluetooth speaker that can connect to your phone so you can listen to your favorite playlist while enjoying a fun and smooth ride. If one of your non-negotiable standards is that your hoverboard should be fast, consider buying this model. It’s one of the fastest on the market today and reaches 10 mph in a short period of time. It can go through various terrains like grass, mud and even sand. It is also semi-submersible and considered waterproof so you can be sure that it will be safe even if it rains. This model can reach up to speeds of 12 km/h and can take on individuals weighing up to 420 pounds. It even has an app you can download so that you can check the distance, speed, and battery life. Finally, it is dust-proof, water resistant and can climb up to an elevation of 30 degrees. There are so many products on the market today, so you need to know which features you must have when looking for a hoverboard. Before making a final decision, be sure to check out this list of some of the best hoverboards so that you can make the best decision for your money. This entry was posted in Uncategorized and tagged Hoverboards. Bookmark the permalink.